Morning Dog Walk: Swallow Nest, Bee Eaters & My Tarantula Is Possibly Dead! 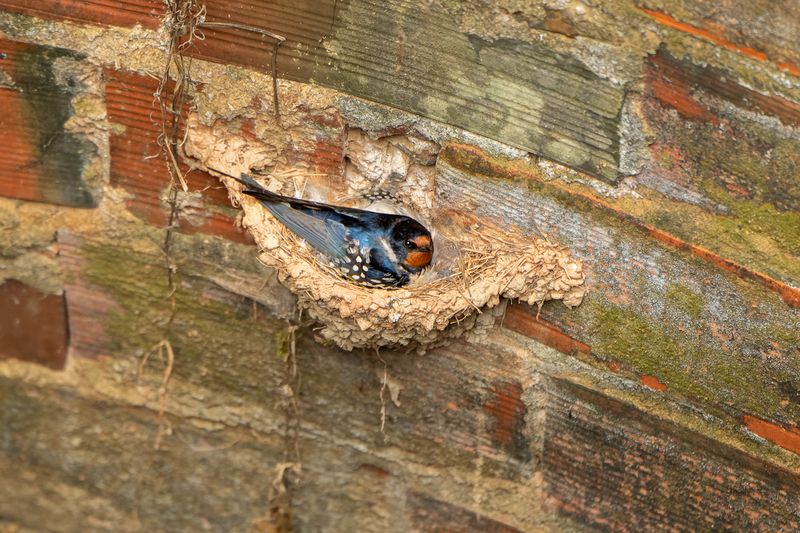 The area was covered in thick mist this morning but I still decided to take the camera along and I took a stop at an old Well to check if the Barn Swallows had started to use the nest. IMPORTANT! – It’s never a good idea to approach a nesting bird but in this instance I used the camera’s Live-View with the screen tilted so that I didn’t actually look over the edge of the well! I pointed the camera like a periscope over the edge of the well and captured this shot of a Swallow already sitting on the nest. It’s both genius and dangerous for them to build this nest here. Of course, no predator can get to the nest, but if the nest falls off it will drop into the water or if a baby falls, it’s going to drown. Of course, when the young fledge, it will be a difficult flight too. This is the 2nd year, they have nested here, so maybe they know what they are doing. I often walk past the first Tarantula Wolf Spider burrow that I discovered last year and this morning she was outside the entrance. Remarkably, she still has her babies on her back. She has been carrying these since October. The females carry the young on their back until they are old enough to leave the burrow. A lot of grass has grown around her burrow making it difficult to get some shots but here are some I managed. 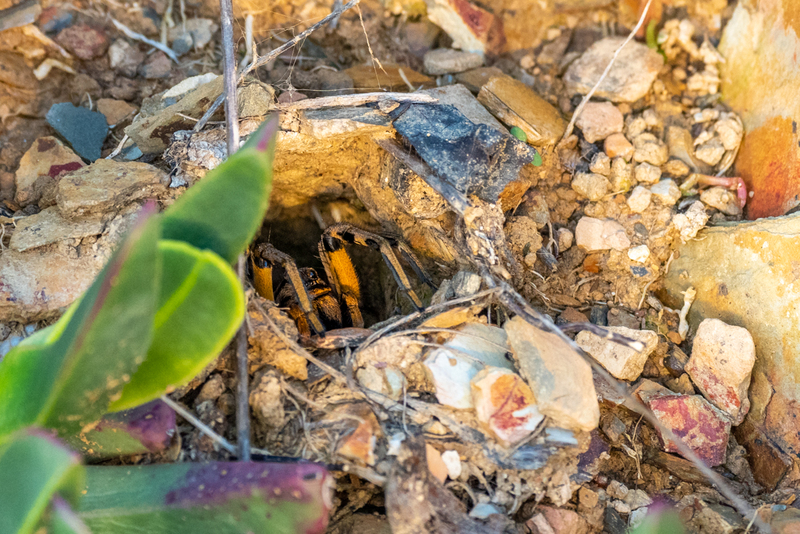 Yet Another Tarantula Wolf Spider Burrow, In The Garden! Myself and Emma took the Dog for his walk this morning and just about to walk down our long drive and Emma said “What’s this hole?”. To our surprise it was yet another Tarantula Wolf Spider Burrow. That is now 3 different burrows that I’m aware of. This afternoon, I waited for her to pop her head out. She has no babies and is a little smaller than my normal one down near the river. 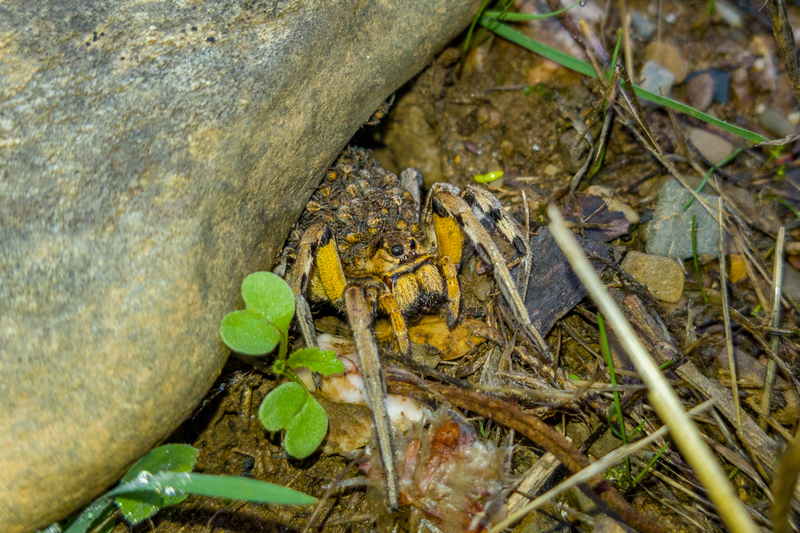 Whilst walking Wally (the dog) this morning, our local Tarantula Wolf Spider (Lycosa tarantula) was out of her nest either feeding on the many flies and ants the rain has brought out or she was making home improvements to her burrow opening. As soon as she saw me she darted into the nest so I set my mobile (Samsung Galaxy S8+) up outside her burrow and left it there while I wandered along to the river. About 10 minutes later I returned to witness her dart into the burrow again. This is the video the phone captured. You can clearly see the babies moving around on her back. They are getting quite large now and some have even started to wander around the outside of the burrow and even leave on their own life adventures. Who knows, maybe she’s outside trying to get them to pluck up the courage to leave. You’ll notice she has quite a nice garden and lawn growing now due to the recent rain. 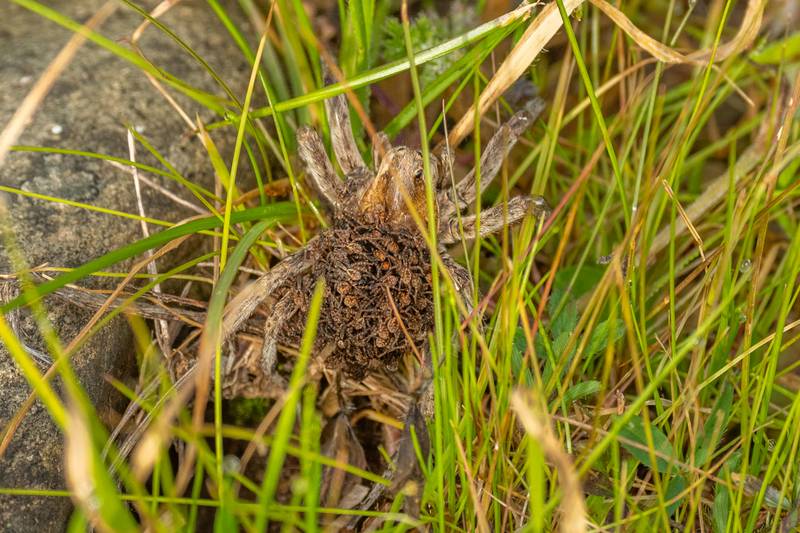 I check the burrow of our local Tarantula Wolf Spider most mornings whilst walking Wally and although she has her babies all snuggled on her back, I’ve not yet managed to have a good look. This morning, armed with only my mobile phone, she gave me a very brief glimpse of her babies. The babies stay on her back until they are large and strong enough to fend for themselves. As you can imagine, she is being very protective of them and doesn’t come out of the burrow very often. Although not a great photo, you can clearly see the babies on her back. Notice how one of them has left her back briefly and is on the burrow opening. It soon jumped back on. Spider-Cave Door Is Closed Again! 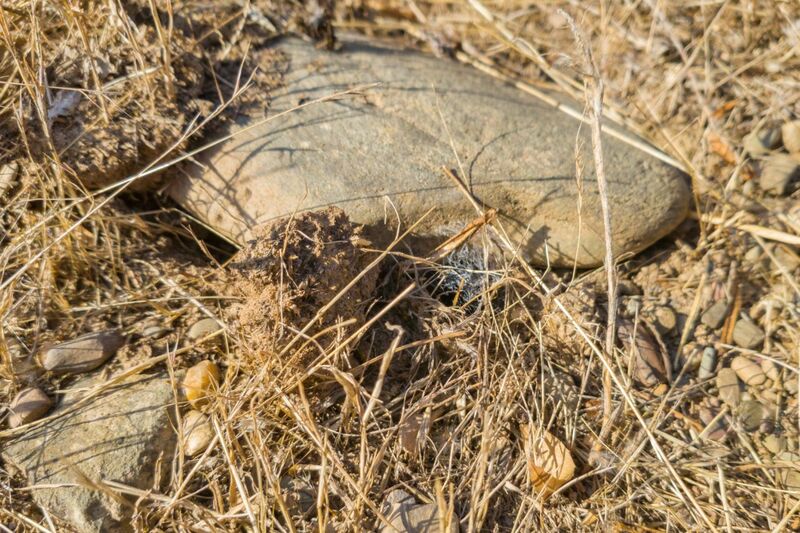 Looks like I was lucky to see the Tarantula Wolf Spider with eggs yesterday as this morning the entrance to the burrow has been closed again. Maybe she needed to feed so temporarily opened it. At least we now know that she is closing herself in to protect herself and her eggs whilst she cares for them.